XRainbow VoIP Cafe System is a carrier-graded total VoIP solution for internet cafe owners to provide voice service over the existing data network. XRainbow VoIP Cafe System includes billing, monitoring and management system for Internet cafes. The management console is optimized for simple and efficient execution of daily tasks. It presents an easy-to-use user interface for phone booth management, transaction management, receipt generation, CDR(Call Detail Record) query, and financial end-of-day report. With our new "XRainbow VoIP Cafe System", you can have total control of your business and improve customer satisfaction. To start your own internet VoIP cafe, all you need is several XRainbow IP phones or internet phone adapters connected to broad-band network and a computer with web browser which can access XRainbow VoIP Cafe System. You have full control of your business, from rates setup, sales person authentication, monitoring, billing, to phone booth management. 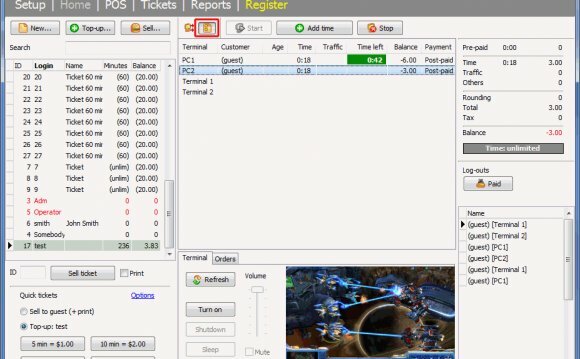 All reports are realtime web based. You can view/print each phone's CDR and tansactions, generate/print customer receipt, and reconcillate cash flow on business end-of-day.